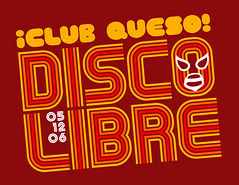 To add spice to the festive spirit I've decided to post a fun 'disco' mix I did for our first ¡Club Queso! - Disco Libre party way back in 2006. You can also download this mix from its SoundCloud page located HERE but you'll have to be a SoundCloud member to be able to do so. Tonight I'm DJ'ing in Lexington, KY at Lower 48 and tomorrow night I'll be at Pink Door in Louisville. If you happen to be in Kentucky then I hope you'll come check out one of the gigs and say 'hi'. More info on these shows can be found by clicking HERE.